I want to subscribe / cancel the GVM newsletter, in order to get current information about GVM. HEDGE21 - "Industry 4.0 for the CFO!" The initiators have a successful track record as serial entrepreneurs: Yvonne Hofstetter has been a manager / entrepreneur, bestselling author (Business Book of the Year 2017) for 20 years and a member of the Data Protection Advisory Board of Deutsche Telekom. CTO Christian Brandlhuber has 25 years of AI experience and in 2001 sold his first firm to a Nasdaq company. 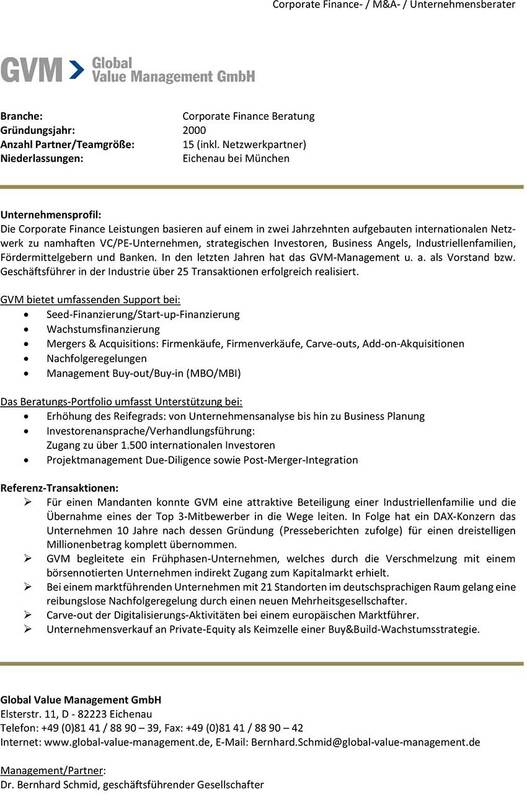 Crossgate AG: GVM supported Crossgate to initiate growth financing by the family office of SAP-founder Dietmar Hopp. Later on, CEO & founder Stefan Tittel sold the company for a 3-digit million Euro sum, according to media reports. Traxpay AG: Commerzbank and Software AG made a strategic investment in this real-time, blockchain-based B2B-platform in 2013. Masterpayment AG: This online payment provider and working capital financier was sold successfully to the Nadaq-listed Net1Group in 2016. According to the company, the 4th venture Quantumrock is, a ‘science-driven software technology company’ focusing on Artificial Intelligence and Machine Learning in the field of ‚Algorithmic Trading‘. Former Accenture-Executives offer with arctic.ten a second-to-none solution which covers all aspects of the CIO/CDO agenda. Arctic.ten enables a unique 360 degree management perspective on: business value, cost, capacity management, technology and supply. In the ‘run IT’ mode features like benchmarking, scenario analysis and time machine offer faster and better decision making. Other vendors cover only parts of the relevant requirements. Therefore, according to Acquaim better results could be achieved within a few days which could be achieved with conventional consulting approaches within several months and with high cost involved: Acquaim estimates that at multinational companies (15 bn Euro revenue, 2% IT cost rate) savings of up to 30 million Euro could be realized. Altanis is German market leader for cutting solutions in the furniture / wood processing industry. The aim is to expand on an international scale in this attractive growth market. The leading cutting solution pCUT has been optimised by Altanis for the last 20 years. pCUT is used by leading furniture and chipboard manufacturer in the German speaking market. Altanis benefits from rising demand via ‚Mass Customising‘ by means of online furniture buying (20 million Euro market, +3,1% in 2015 according to IFH Köln) and the growing pressure on the supply chain: According to Altanis, Altanis customers can optimise ‘on a fingertip’ the cutting structures which enables up to 20% in productivity increase compared to existing solutions. Under the theme 'Between tradition and innovation: Invent the organisation in a new way', decision makers will meet at the management & organisation flagship congress in Düsseldorf. Bernhard Schmid supported the acquisition of the speakers - amongst others executives from the following Blue-Chip companies will present: Bayer, Cewe, Fraport, Roto-Frank, Unitymedia etc. Under the theme 'Cross Industry Innovation' decision makers will meet at the innovation flagship congress in Frankfurt with the aim to learn from best-practices from other sectors. Bernhard Schmid supported the acquisition of the speakers - amongst others executives from the following Blue-Chip companies will present: Axel Springer, comdirect, Deutsche Bahn, Evonik, Fraunhofer etc. Based on over 25 years of experience in the high-tech industry as General Manager / Board Member of (listed) companies or Director at an Accenture company Bernhard Schmid supported the acquisition of the speakers. Renowned Key-note speakers are Executives of Blue-Chips like Adam Opel, BSH, DHL, Ford, Kuka or Robert Bosch amongst others. Dr. Bernhard Schmid moderates the podium discussion "How will the Robotics Market develop in the next years?" Valtech the first Independent European agency in digital and technology marketing, enhances its market share in Germany: Global Value Management (GVM) supported, the German Top10 agency Valtech successfully in searching and for suitable take-over candidates to enhance its market position in Germany. In the verge of this transaction People Interactive (founded 1999 in Cologne) is taken over with its 80 employees comprising approx. 10 million Euro in revenue. With this new acquisition, Valtech (active in 5 continents) reinforces its expertise in creativity, design and customer experience with now more than 300 employees at premises in Düsseldorf, Munich, Frankfurt and Cologne. Dr. Bernhard Schmid moderates the forum „Reduce Failure Rates – Optimise Product Quality“. Key-note speakers are amongst others executives of blue chips companies like Blue-Chip-Unternehmen like Evonik, Infineon, Deutsche Bahn, Linde or MAN. Based on over 25 years of experience in the IT industry as General Manager / Board Member of (listed) companies or Director at an Accenture company Bernhard Schmid supported the acquisition of the speakers. Renown Key-note speakers are CIOs / Executives of Blue-Chips like FC Bayern München, Flixbus, General Electric, Schaeffler or Volkswagen amongst others. Bernhard Schmid moderates the trend forum "Focus Governance & Agility". With its Smart Engineering Cloud (SE3) platform Acentrix focuses with Alvaronic a 100 billion Euro market. GVM supports Acentrix / Alvaronic as regards growth financing for the SE3 cloud solution in the area of Internet-of-things (IoT) and ‘Industrie 4.0’ (I4.0) to foster market leadership. from on-premise inhouse IT infrastructure to highly scalable and adaptive, collaborative and secure cloud environments, which are essential in realising IoT / I4.0-solutions. As first mover Acentrix offers with SE3 a so called Multi-CAD/PDM cloud platform, which enables quantum leaps as regards productivity (30% ratio according to company information) - non-redundant on the basis of a high performance file system. An international ITC-company with several 1,000 employees engaged Global Value Management within its expansion strategy for Germany within a comprehensive M&A mandate. In doing so, GVM’s job is to identify M&A candidates and to facilitate the M&A process. The goal of the concern is to foster its market position as one of the Top-10 vendors in its segment in order to reach a top-3 position. Based on over 25 years of experience in the IT industry –amongst others- as General Manager / Board Member of (listed) companies or Director at an Accenture company Bernhard Schmid supported the acquisition of the speakers. Key-note speakers are amongst others CIOs / Executives of Blue-Chips like BMW, Datev, Deutsche Bahn, HSV, Otto or Zalando. Bernhard Schmid moderates the podium discussion "Mission IT: Pathfinder for new Business Models – but how?". 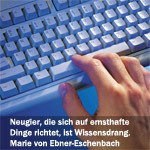 During the 8th executive meeting of the IT & Communications-sector GVM CEO Dr. Bernhard Schmid will make a presentation regarding mergers & acquisitions, succession planning and growth financing: ‚M&A: It's an Art not a Science: Psychology decides about success and failure of Corporate Finance Transactions!‘ like every year in 2016 at Steigenberger Hotel Sonnenhof, Bad Wörishofen, the best ITC-companies will be awarded. Under the slogan „Re-think Insurance“ decision makers meet in Munich. 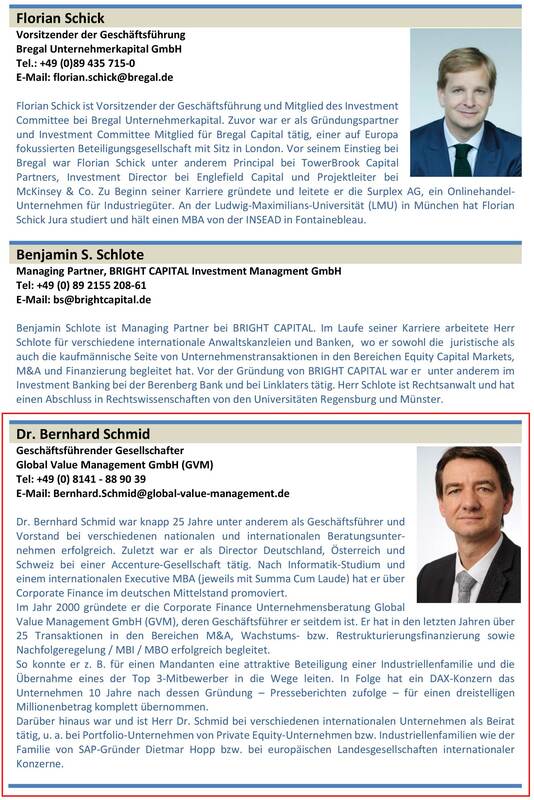 Bernhard Schmid supported the acquisition of the speakers - amongst others executives from the following Blue-Chip companies will present: Allianz, Barmer, Ergo, Generali, Münchener Rück, etc. Decision makers meet for the international congress fair for customer service, communication and contact centre for nearly two decades in Berlin. Bernhard Schmid supported the acquisition of the speakers - amongst others executives from the following Blue-Chip companies will present: Consors, Daimler, E.ON, Google etc. What chances 'the Brexit' will have for the financial centre Frankfurt will be discussed amongst others by the Hesse Finance Minister as well as executives of renowned national and international banks like Commerzbank or Royal Bank of Scotland etc. This sector is extremely attractive as, for example, the German company 6Wunderkinder was acquired by Microsoft (according to press) for more than 100 million Euro. In relation to their App Wunderlist Checkware focuses a much bigger and more profitable market: According to Gartner Group by the year 2020 more than 21 billion appliances should be connected. As first German 'one stop shop' Education / Learning Platform quofox covers all mega trends of learning as regards individuals and organisations and transfers this via an open platform into a business model which comprises all players in the market favourably. The basis builds a 30 year long experience of the founder as serial entrepreneur, who implements the trend „from E-Learning towards Learning Solution“ (Bitkom) successfully as first blue chip customers show: quofox integrates all offers of vendors (on-site, online coaching, E-Learning, micro learning) as a means of 'Google of Knowledge' - within a win-win-model for both sides. Congress advisor and GVM CEO Dr. Bernhard Schmid takes part the podium discussion "The entrepreneurial hype - organisational structures for successful cooperations". Key-note speakers are amongst others executives of blue chips companies like Blue-Chip-Unternehmen like Deutsche Telekom, Lufthansa, Robert Bosch or SAP. GVM CEO Dr. Bernhard Schmid supports with his C-level network the congress vendor in acquiring the key-note speakers. Amongst others the Board Members / Managing Directors of Commerzbank, Deutsche Bank, HypoVereinsbank will present at the congress. GVM supports SONIC Performance Support exclusively regarding growth financing in order to drive forward the international expansion. SONIC was founded by Jörn Oelze, CEO and owner, of the German franchise headquarter of New Horizons, in order to address the growth market eLearning with innovative products to gain a market leading position. The basis builds the 20 year long experience, for example, as market leader of Microsoft trainings with 18 on-site training centers in Germany, Austria and Switzerland with blue-chip customers such as Deutsche Börse, Beiersdorf, Flughafen München und various others. On the basis of more than 200.000 training participants, with the Instant Learning Server a new video-based trainings concept has been developed. On the basis of a 'full content' search users can for the first time follow video sequences 'on demand' which are needed for solving a specific problem with as little work interruption as possible. With its patented ‘thermolyse’ process Pyrum could gain real petrochemical oil out of waste like used tires, EPDM (e. g. rubber seals), PE/PET (e. g. one-way bottles), Polystyrene (e. g. styrofoam) and Plexiglas. News Magazine Wirtschaftswoche ranks Pyrum amongst the 30 most successful Green Tech companies in Germany. The first 5,000 tons plant went into production in the first half of 2015 according to company information. Currently the first industrial customer plant is going to be built (worth a two digit million Euro amount); in addition the Pyrum could conclude deals worth a several digit million Euro amount according to company information. GVM supports Pyrum at the search for expansion financing. What does 'digitalisation' mean already today for the players in the energy sector?' Decision makers form EnBW, GE, Google, HEAG, RWE and others will discuss this in Berlin. GVM supported at the acquisition of the key-speakers. 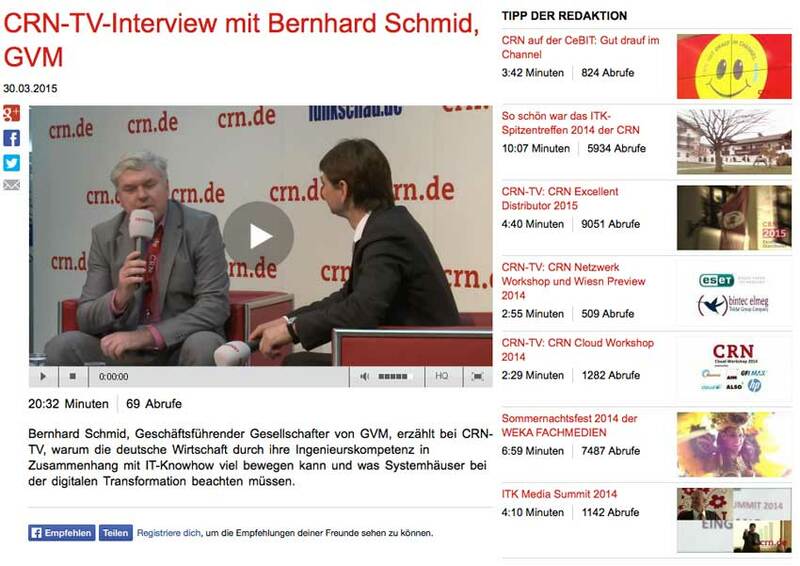 Dr. Bernhard Schmid, Founder and Managing Director von GVM, tells at CRN-TV, why the German Economy can excel with its engineering excellence in conjunction with its IT-Know-how and what system integrators have to take care of in the verge of the ‘digital transformation’. You can find the 20 minute TV-Interview here. Under the headline „The digital future of Insurance“ decision makers of insurance companies meet in Frankfurt. GVM supported at the selection of Board Members and General Managers of AXA, ARAG, Gothaer, MLP or Zurich etc. The motto of this Management Circle congress in Berlin is this year: ‘Energy Supply 2020 – not central anymore and connected in an intelligent way!‘ Based on his long consulting track-record in these sectors Dr. Bernhard Schmid was to a great extent responsible for the design of the congress content and the acquisition of the speakers. Key-note speakers are the President of the Bundesnetzagentur well as others CEOs, Board Members and General managers of Blue-Chips like E.ON, MVV, RWE, TenneT, just to name a few. Please find the congress flyer here. After his successful trade-sales of Crossgate to SAP Stefan Tittel now revolutionises the Online / Mobile-Payment Sector: Cost leadership with the most sophisticated features! Masterpayment believes to be the first ‚All-in-one‘ Online / Mobile-Payment Provider in Europe. GVM supports Masterpayment at growth financing. For example Masterpayment is the first European vendor to provide mobile phone card reader functionality as regard mobile payment solutions (with a special smart phone adaptor). Until the end of the year 2013 19 European countries should be addressed. A highly scalable, cloud based technology enables the registration by a comprehensive self-service. A unique API framework enables a quick distribution and an easy adoption of web shops. Until the end of 2013 19 European markets should be adressed. In order to further empower high-tech companies to better position themselves at investors, clients and strategic partners aiti-park offers entrepreneurs evenings. GVM founder Bernhard supports in setting up the concept and will carry out the workshop series based on his year-long experience as General Manager or Board Member well as Director of an Accenture corporation. 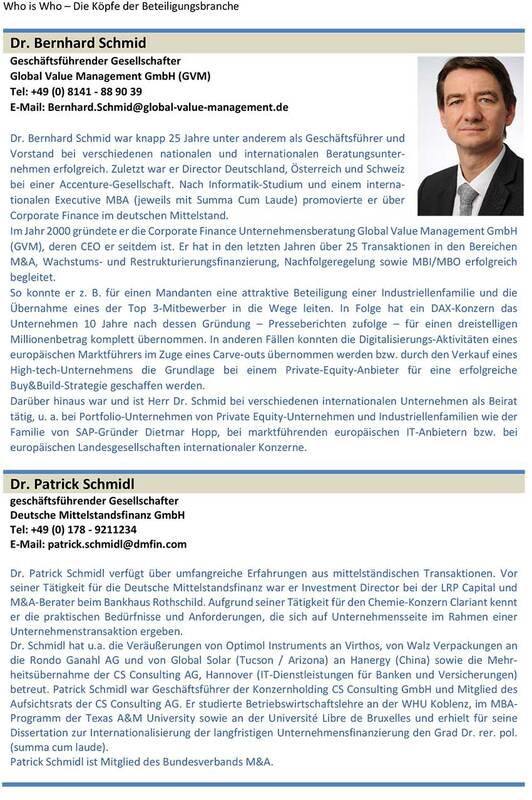 During his career Dr. Bernhard Schmid facilitated the expansion of various IT-companies and successfully realised more than 25 corporate finance transactions. You can find the workshops here. GVM-Workshop at 26.6.2013: Get direct access to decision takers with the ‚right message‘! GVM-Workshop at 24.07.2013: Be more successful with an ‚Integrated Marketing- & Sales Cycle (IMSC)‘! GVM-Workshop at 28.08.2013: Sales above the budget line – successful at C-level! GVM Presentation at 53. IT Entrepreneurs Evening: "More Profitable Sales with an Integrated Marketing & Sales Cycle (IMSC)"
In order to further empower high-tech companies to better position themselves at investors, clients and strategic partners aiti-park offers entrepreneurs evenings. GVM founder Bernhard supports in setting up the concept and will carry out the presentation at June 12th base on his year-long experience as General Manager or Board Member well as Director of a Accenture corporation. During his career Dr. Bernhard Schmid facilitated the expansion of various IT-companies and successfully realised more than 25 corporate finance transactions. The motto of the 4th strategy congress is 'Take market chances – secure growth potentials'. Based on his long consulting track-record in these sectors Dr. Bernhard Schmid was to a great extent responsible for the design of the congress content and the acquisition of the speakers. Key-note speakers are amongst others CEOs, Board Members and General managers of Blue-Chips like ABB, AGCO, ebm-papst, Festo, Salzgitter Konzern, Starrag Group, ThyssenKrupp, Zeppelin, just to name a few. ConMoto Partner Dr. Bernhard Schmid moderates the sections 'Challenges of the Future‘ and „Repositioning in International Competition“ as well as the podium discussion „Made in Germany” vs. „Made in China?”. GVM supports belingoo at growth financing regarding the mega market languages learning / digital publishing for an international audience. According to belingoo the company offers the less time consuming and most successful method to improve one’s language skills – for every level of knowledge: Especially grown up people experience a lack of time, motivation and concentration by using traditional offline and online courses with traditional vocabulary and grammar learning besides their jobs. The key to up-to 50% higher learning performance lies in belingoo’s second-to-none context sensitive learning concept of 'en passant' learning. Role model are countries like Luxembourg, the Netherlands or in Scandinavia, where people gain their language skills via reading, listening and watching of foreign language content ‘on the fly’, for example, via English movies with Dutch sub-headers. belingoo has intensified this effect by multiple means of functions and offerings: A team-orientated platform has been established with authors, Facebook teams and customers for a worldwide audience which can easily be used without high translation cost publish multilingual content -in print and digitally for all means of (mobile) appliances. Depending on the skill level technical terms or middle / highly difficult words are ‘annotated’: This means that for these and only for these words, translations are provided. A person can therefore read a foreign langue text in the original version fluently due to the precise annotations. He can mark relevant annotations easily which can be ‘trained’ later on in a context sensitive manner. The effect: significant saving in time regarding the relevant vocabulary and a quick learning success. The annotation can –in addition- be generated automatically with the worldwide leading language technology of DFKI (www.dfki.de) and –as an option- be optimised by the user. As content interesting (leisure) as well as professional texts, audio or video material can be annotated. The variety of options ranges from company specific data sheets for international sales representatives to internal language learning programs to revenue sharing models in the B2C area. Examples could include: special annotated ebooks, crowd authoring / Social Web authoring to opening up the context sensitive advertising market on mobile devices juts to name a few. In order to further empower its start-ups Microsoft partners, Microsoft offers for the General Management of its IT partners strategy workshops regarding elevator pitches and investor presentations GVM founder Bernhard supports in setting up the concept and will carry out these workshops based on his year-long experience as General Manager or Board Member of Microsoft IT partner as well as Director of the Microsoft-Accenture Joint-Ventures Avanade. During his career Dr. Bernhard Schmid facilitated the expansion of various IT-companies and successfully realised more than 25 corporate finance transactions. As Partner of the Con Moto Consulting Group Dr. Bernhard Schmid moderates this year again the prestigious Automotive Lean Production Congress of Agamus Consult, a member of the Con Moto Group. Up to now, more than 600 automotive plants from 15 countries took part in the respective categories. The introductory key-note will be held by at November 7th by BMW Board Member Frank-Peter Arndt at Congress Center Leipzig in Leipzig. Please find enclosed the overview of the ‚Best Automotive-Plants of the Year 2012‘ as well as the Congress agenda here. The strategy congress will take place for the fourth time in 2012 - this year in Munich. 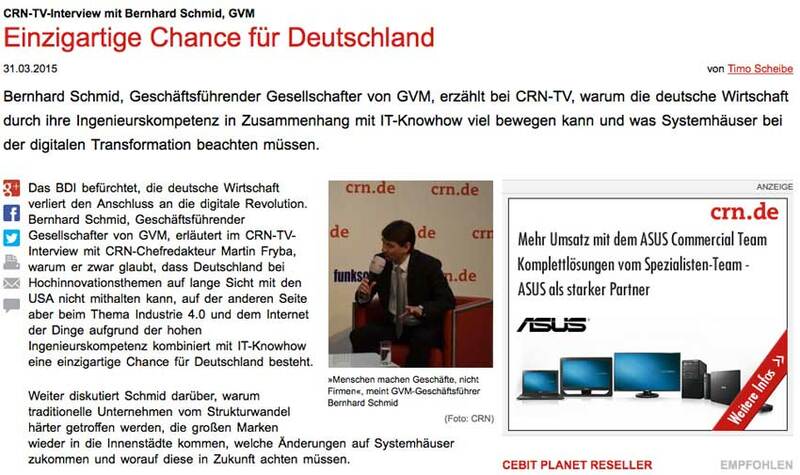 news magazine FOCUS carries out its annual IT conference in Hamburg. Based on 20 years of experience in the IT industry –amongst others- as General Manager / Board Member of (listed) companies or Director at an Accenture company Bernhard Schmid was to a great extent responsible for the design of the congress content and the acquisition of the speakers. Key-note speakers are amongst others CEOs, Board Members and CIOs of Blue-Chips like Bosch Siemens Hausgeräte, Carl Zeiss, Commerzbank, Deutsche Postbank, EnBW, Flughafen München, HANIEL, Hapag Lloyd, Heidelberger Druck, HIPP, LANXESS, Trumpf and Wacker Chemie. Dr. Bernhard Schmid moderates the sections and Podium discussions 'IT between user demand and reality: (Web 2.0-) networks – hype or ultimate goal or IT?' as well as 'Brave new world – Advantage by means of innovation & technology?". GVM supports the Swiss company PhytoEnergy by searching for the financing of an interesting project in South Africa. From 19. July to 27. September Computer Partner a leading decision maker magazine for IT system integrators and IT-consultants publishes nine articles from GVM general manager Dr. Bernhard Schmid regarding relevant aspects of corporate financing. On the basis of aprox. 25 transactions in the IT sector entrepreneurs and CEOs of IT companies are provided with infromation regarding topics like private equity, alternative means of finance, M&A, Management Buy-Ins / Buy-outs, Investment Case documents, pricing issues and negotiation strategies. In the first article published this week a comprehensive overview on corporate finance strategies is provided. The 2. FOCUS-Symposium Automobile of the Future - Players, Markets and Technologies of the Future will take place at August 30 / 31 2011. Bernhard Schmid was appointed to be congress advisor. Other members are amongst others: Prof. Dr. Lutz Eckstein, Leiter des Instituts für Kraftfahrzeuge, RWTH Aachen University, Prof. Dr. Peter Gutzmer, Geschäftsführung, Technische Produktentwicklung, Schaeffler GmbH, Prof. Dr. Friedbert Pautzke, Institutsleiter, Institut für Elektromobilität, Hochschule Bochum and Prof. Dr. Bernd Wiedemann, Leiter des Fachgebietes Verbrennungskraftmaschinen, TU Berlin and former Sprecher des Markenvorstands, Volkswagen. Please find the congress program here. Global Value Management supports the pioneer amongst the European Cleantech Funds regarding the acqui­si­tion of new portfolio companies and regarding exit options. WHEB Partners‘ development started at 1995 with as award winning incubator for environmental friendly technologies and consulting company as regards corporate financing before the company started to manage Private Equity funds. In the year 2005 WHEB Partners initiated the first broad range cleantech funds. With office in Munich and London the company currently manage a three digit million Euro funds volume. Amongst its portfolio range companies like, for example, Petainer (leading manufacturer of environmental friendly packaging) or VIA Optronics, a manufacturer of energy-saving displays for mobile phones. neuroConn's vision is to use its high-quality, multi-functional equipment to enable therapies free from any side effect. According to company information neuroConn is the world's first supplier which is completely certified in a central area of application. The unique non-invasive therapy of neuroConn can be successfully applied in the treatment of strokes, epilepsy, migraine, tinnitus, depression, multiple sclerosis, dementia and chronic headache. neuroConn's revenues doubled within the last year. as Web 2.0 order and job agency in the internet since 2009. 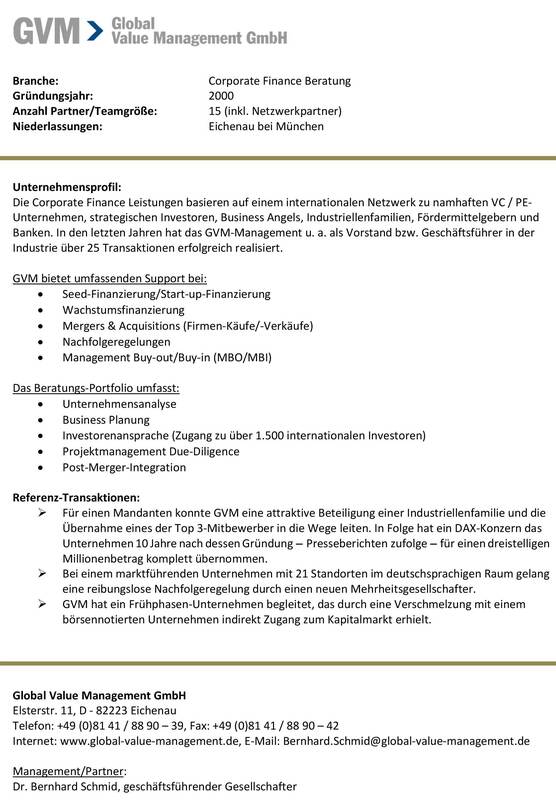 GVM supports skillsbook exclusively at Growth Financing, in order to foster the extension of the platform in order to fuel growth in Germany an abroad. skillsbook was founded by three manager / entrepreneurs with more than 20 years of business experience. The aim is to become market leader as the service marketplace regarding SMEs and private persons until 2014. Therefore, skillsbook addresses a market potential of more than 10 million corporations / persons in Germany. The USPs of skillsbook are: free access, total cost transparency, attractive terms & conditions for state-of-the-art company presentations and jobs ads via text, picture shows, audio, video and even one's own homepage, ease of use and a minimum of administrative effort. Dr. Bernhard Schmid supports MBPW Workshop "Finance Plan"
Being Coach and Member of the Jury of the "Münchener Business Plans Wettbewerb" Dr. Bernhard Schmid will carry out a Workshop regarding "Finance Plan". MBPW is one of the leading Founder Networks worldwide. 323 millions have been invested in 430 companies creating several thousands of new jobs. GVM supported Fourth Project successfully at searching in the search of a new majority shareholder: During this transaction the shares from the former majority shareholder were transferred. The remaining shares remain with the founder and General Manager Holger Bergmann. Fourth Project was founded in the year 2002 in Wolfsburg as IT-oriented consulting company with a focus on concerns. Currently 200 employees generate two digit Euro revenues in Germany and another European country with its 6 premises. Maurizio Capital is specialised at taking stakes in companies which need hands-on and strategic support and who are searching for a new equity stakeholder who takes over equity risk with a strong operational support. SMEs between Basel II and financial crises – what options regard SMEs, banks and Private-Equity as viable regarding corporate financing? After the default of Lehman Brothers the effect of Basel II on corporate financing of German SMEs was evaluated via a research at the University of Bradford which was sponsored by Global Value Management (GVM). Although the ‘real economy’ as well as the ‘financial world’ stood under the impression of the financial crises, the influence of Basel II on corporate financing of German SMEs is regarded as high or partly as even higher than the financial crises. The article provides a summary of the research findings and shows, which financing strategies SMEs should deploy under the Basel II regime in the light of the financial crises. 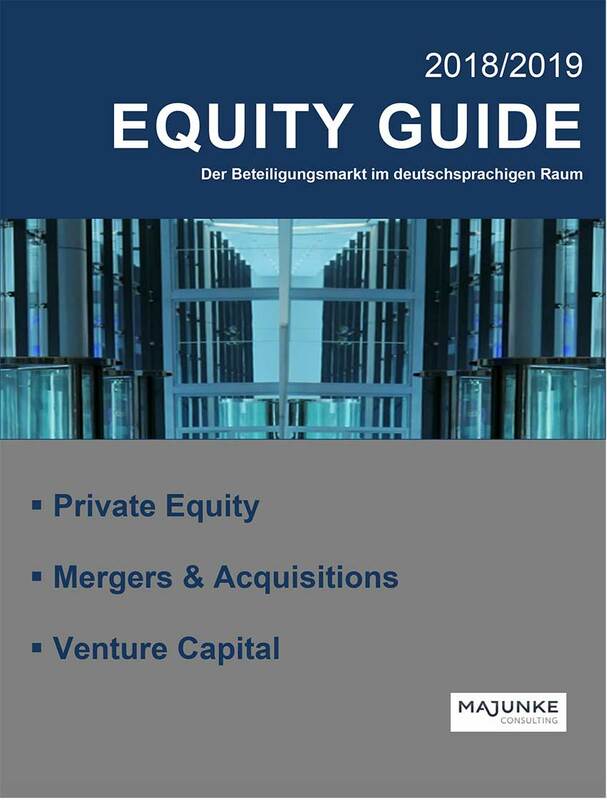 As one of the leading, listed Seed Financing Companies, MIC AG is a sponsor of he KfW Equity Forum, April, 28th / 29th 2009. GVM founder Dr. Bernhard Schmid is going to moderate the workshop of MIC AG. On the podium will be Claus-Georg Müller, CEO MIC AG, Dr. Gunther Vollrath, CEO of MIC portfolio company Aifotec Fiberoptics as well as Olaf Jacobi, Partner, Target Partners. GVM founder Bernhard will carry out these workshops based on his year-long experience as General Manager or Board Member of several IT and consulting companies as well as Director of an Accenture company. During his career Dr. Bernhard Schmid facilitated the expansion of various IT-companies and successfully realised 20 corporate finance transactions. Global Value Management has supported the Management Buy-out process of the strategy consultancy Agamus Consult GmbH out of the Otto Wolff von Amerongen group. This includes the support at developing the investor material, structuring the financing and especially the acquisition of financing at a renown financing institution. With this transaction the remaining shares of the former majority stakeholder from the Otto Wolff von Amerongen group were taken over. The Managing Directors Alan Brunhammer and Dr. Werner Geiger as well as other members of the Agamus manage­ment increased heir share or acquired a stake for the first time in the company. Agamus Consult was founded in 1994 and is one of the leading international consulting companies with a focus on ‚Lean Production / Lean Management’ with premises in Germany, France, Spain and Slovakia. Once a year Agamus awards the price ‚Auto­mo­tive Lean Production Award’ for the best automotive plant in Europe. Amongst Agamus customers in Western and Eastern Europe, USA and Africa are numerous renown Blue-Chips like Areva, Audi, BMW, Bosch, Daimler, Ford, Renault, Siemens, ThyssenKrupp or ZF. GVM supported Management-Buy-In-Process in the verge of a successor regulation at Signum Bildtechnik GmbH. This comprises conducting the negotiation, structuring the financing, coordinating the context of the due diligence and acquiring means of a management-buy-in financing. With this transaction Dr.-Ing. Martin Hainfellner acquired the majority stake and became the new Managing Director of Signum Bildtechnik GmbH, München. He has a yearlong experience in the international IT / telecommunications industry. Prior to the MBI Dr. Hainfellner was responsible for international projects at a leading global telecom concern. He is now managing the business as the former major shareholder and Managing Director is retiring after a short interims period. Signum Bildtechnik is a leading vendor in Digital Picture Processes with its business lines professional soft- and hardware for TV stations (Broadcast) and the processing of high-speed picture sequences (Motion). Customers of Signum in the business lines Broadcast and Motion-Systems are ARD and ZDF or ADAC, TÜV and OEMs like VW, Daimler and BMW. As corporate finance advisor Global Value Management (GVM) supported Dynavisions with upfront-activities regarding the M&A transaction. Dynavisions is a technology leading CE-vendor -who integrated as one of the first suppliers worldwide- HDTV- as well as Internet-TV on one single set-top-box. Because of an exclusive promotion during MediaMarkt’s “brand new” tour throughout 200 premises Dynavisions is one of the well-known renown set-top-box brands. According to company information the agreements means that Dynavisions GmbH will become a 100% subsidiary of Novastor, a listed company at the Frankfurt stock exchange (new: Novavisions AG). The data storage and security specialist NovaStor Software AG (Rotkreuz, Switzerland) and the Dynavisions GmbH (Munich, Germany) will act as subsidiary of NovaStor AG and will still be under their own brand names. After the expansion financing of the portfolio company of the family of SAP-founder Dietmar Hopp at indatex SCI, the take-over of a majority-stake of B&N by Crossgate AG this is the third big corporate finance mandate in this year. GVM supported Dynavisions with the realisation of the Investment-Case, the investor screening and the negotiation with potential Investors. In order to further empower Microsoft partners, Microsoft offers for the General Management of its IT partners strategy workshops regarding „Successfully implementing growth strategies: Make efficient use of Corporate Finance Options “ as well as „More profitable revenue by means of an “Integrated Marketing & Sales Cycle (IMSC)“. GVM founder Bernhard will carry out these workshops based on his year-long experience as General Manager or Board Member of Microsoft IT partner as well as Director of the Microsoft-Accenture Joint-Ventures Avanade. During his career Dr. Bernhard Schmid facilitated the expansion of various IT-companies and successfully realised 20 corporate finance transactions. After having managed to win the family holding of the family of SAP founder Dietmar Hopp as a new investor in Crossgate in April 2006, GVM supported Crossgate to close another deal: The EDI specialist Crossgate (formerly named as Indatex SCI) acquired a majority stake in B&N Software AG (Rosdorf/Goettingen). The transaction was carried out after an intensive evaluation of over 50 companies in Western and Eastern Europe. With this acquisition, Crossgate positions itself as on of the leading players in the European B2B Integration Business. Under the umbrella of both companies, more than 2000 customers, 32.000 business partners and nearly 200 employees at 6 European sites holding Europe's biggest partner repository. One of the biggest European EDI-vendors emerges who aggregates the biggest EDI-business in Germany according to the company. Strategic aim of the acquisition is to develop new services approaches regarding EDI- and B2 integration solutions. Under the mandate of Global Value Management (GVM) as Corporate Finance consultancy the family of IT-visionary and SAP-founder Dietmar Hopp took a stake in indatex SCI. By means of a capital increase 28% were acquired for a two-digit million Euro amount. The GVM client indatex SCI was founded in the year 2001 and belongs to the group of Wolff von Amerongen, one of the most renowned German privately owned holding companies. With 1.25 billion transactions indatex SCI has established itself as one of the leading specialists regarding data exchange and B2B integration for e. g. complex logistic chains. The Business Integration Platformô with more than 250 clients and thousands of linked business partners processes B2B-business data automatically and converts the formats regarding the various IT-infrastructures accordingly. The fee is transaction based. Please find further information in Deal News 15-17 as well as in the press information of indatex SCI.